This year’s Champion Beer of Scotland went to Orkney-based Swannay Brewery for their Orkney IPA. 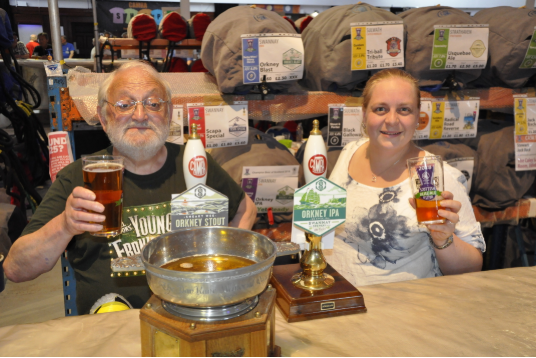 It’s the fifth time Swannay Brewery has won the title, after first winning with Dark Munro in 2007, Scapa Special won in 2008, Orkney Blast won in 2010 and Orkney Best won in 2012. Swannay was known as the Highland Brewery for much of that time. The beer has been made for eight or nine years is and has gone from strength to strength. It’s a good old mix of European hops with a handful of American hops added to provide some zestiness. This year’s silver award went to Black Isle Brewery’s Hibernator, a 7% ABV barley wine Orkney Brewery’s Red MacGregor, a 4% ABV bitter took third place. All three of the beers will be available to sample at the Scottish Real Ale Festival. The Champion Beer of Scotland recognises the best beer that can be found specifically in Scotland. It also marks the opening of the Scottish Real Ale Festival, which takes place in Edinburgh at the start of July each year.